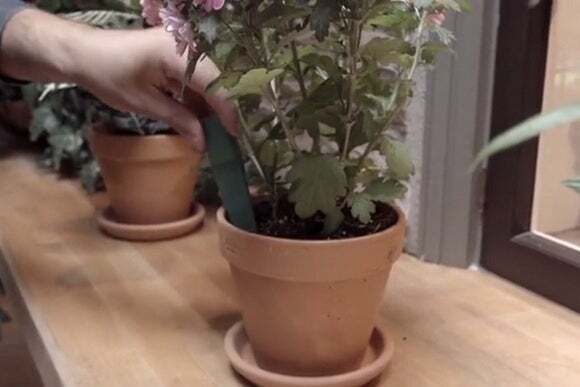 Augmenting your green thumb through technology could get a lot cheaper with a new Kickstarter project called Daisy. Daisy is a connected plant monitor that measures light, temperature, and moisture. It slides into the soil of potted plants, and sends information to smartphones via Bluetooth. Through a companion app, users can enter information about the plant (including the species and nicknames) and receive notifications when the plant needs care. Daisy will run on two coin cell batteries, which will need to be swapped out every three years. Though it's hardly the first plant monitor on the market, Daisy aims to undercut its rivals on price. A single device will cost $20, while an eight pack costs $115. By comparison, Parrot charges $50 for one of its Flower Power sensors, while Koubachi's indoor sensors cost $70 each. On the downside, Daisy's use of Bluetooth instead of Wi-Fi (as used by Koubachi) means you must be within 30 to 50 feet of the plant to gather data. Daisy also can't measure fertilizer levels, as Parrot's sensor does. As a Kickstarer project, the usual caveats apply as well. Though Digital Spring (the maker of Daisy) is aiming to ship in June, it doesn't yet have the light sensor working in its prototype, and its low cost hinges on using thin plastic that will hopefully allow light to come through. If that doesn't work, Daisy will have to develop a clear window for the sensor, causing delays. At least the company is open about its challenges. Why this matters: Existing sensors might make sense for a potted plant or two, but the costs add up quickly if you're dealing with a half-dozen plants or more. If Daisy can deliver on its promises, it could make plant care much easier for those who don't have the hang of it on their own.